Last Friday they were discussing sandwiches on WYPR's Midday with Dan Rodricks and it got me thinking about sandwiches I have known. 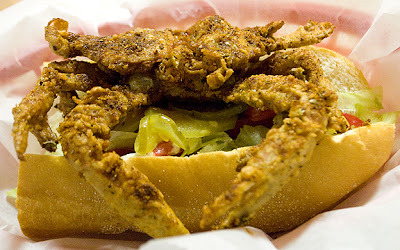 I put in my two cents by recommending the po' boys from my friend Don's restaurant Cajun Kate's in the Booth's Corner Farmers' Market in Boothwyn, PA, because it's one of my current favorites (especially the brisket, fried oyster, and soft shell crab versions), but that's not the only sandwich that has struck my fancy over the years. When I was quite young, my maternal grandmother had a stroke. During her recovery, we ate lunch together every day, and every day it was the same thing - an imported deli ham sandwich with iceberg lettuce and Kraft thousand island dressing on seeded rye bread from Levin's bakery, with a side of Funyuns. I don't know the origin of the sandwich, but I suspect it was my mother's invention, as I have never seen it elsewhere. Occasionally, when I'm feeling particularly nostalgic, I have a ham on rye with lettuce and thousand island for lunch. It never fails to take me back to age 3, when being cute and entertaining came far more easily. Another sandwich I enjoyed in my youth, but not nearly as often, is the Baltimore classic, pit beef. It seemed that I only ate them in the first weekend of October, when the Fells Point Festival was in full swing. We lived on the 500 block of Ann Street at the time. Dad and I always walked down together in search of a pit beef sandwich, which Dad would order well-done, with burnt ends, to which we'd add mayonnaise and enough horseradish to make our noses run. Oddly, we always had to share the sandwich (Dad's rule, not mine), so I tend to feel a little greedy that now, as an adult, I get to have my own. When I like something a lot, I try to eat it often, but not often enough to tire of it. Back in the heyday of Harborplace, there was a little Greek stand on the second floor of the Light Street pavilion. After a morning of desultorily shuffling from shop to shop with my college buddies Leslie and Wanda, we'd occasionally grab lunch there. My personal favorite was a veggie pita, basically a gyro without the meat. If I remember correctly, a warm and fluffy Greek pita was piled high with a combo of lettuce, tomato, raw onion, and cucumber and glopped with tzatziki and feta before being wrapped in aluminum foil to make the messy sandwich easier to handle. So simple, but so good, and something I could eat once a week without getting bored. I'm also quite fond of a good chicken salad sandwich, and by "good," I mean chicken salad made with a mix of white and dark meat, chopped into fairly small pieces, a generous but not overwhelming amount of mayonnaise, and bits of minced onion. The seasoning can be simple salt and pepper, or something fancier like curry powder and mango chutney. The bread can be rye or a nice artisan loaf. Chicken salad sandwiches I am currently fond of include, believe it or not, the ones found at the University of Maryland Medical Center's Aramark-run cafeteria. The sandwich ladies are not skimpy with the scoops of salad, and they carefully remove the tough part of whole romaine leaves before arranging them carefully on your sandwich. And it's a steal at about $4. Mary Mervis, in the Lexington Market, also makes a fine chicken salad sammie. I like to make it a Chicken Smith by requesting a salty addition of a slice of Smithfield ham. This sometimes confuses the sandwich makers, so tell them to slice and weigh the ham and add the price to the sandwich.